The coast of Louisiana is under threat because of sea level rise and land subsidence. Sea water is encroaching deeper inland and as a result Louisiana is losing at an alarming rate. The combined effect of sea level rise and land subsidence is variable spatially. This paper focuses on this combined effect in identifying the transportation infrastructure that is at risk of getting affected by the sea-water inundation of the land. 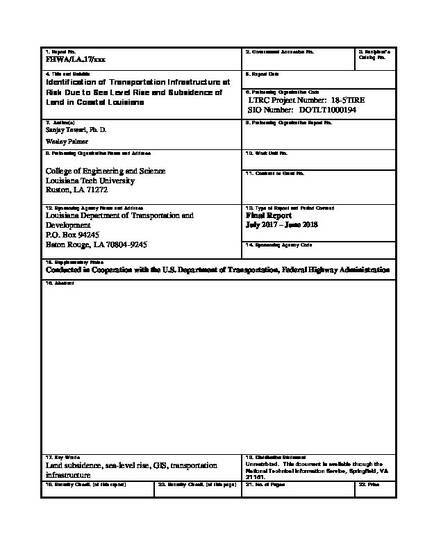 This paper is an attempt of taking account of land elevation data monitored continuously at various locations along the coast of Louisiana and combining it with local sea level rise to arrive at the extent of land that will be lost because of rising sea water. GIS was used to process the collected data, put it in spatial format and identify the transportation infrastructure that is at risk for next 100 years, with 10-year increments starting from 2014. Open source data made available by federal agencies was processed using ArcGIS to develop spatial surfaces and intersect those surfaces with transportation data. The results suggest that land subsidence is having greater impact on transportation infrastructure than sea level rise. It is projected that by year of 3014, about 2,945 miles or 21% of the existing transportation infrastructure will be impacted because of the combined effect of land subsidence and rising sea level. This estimate does not take account of effectiveness of extensive levee system present in parts of coastal Louisiana.